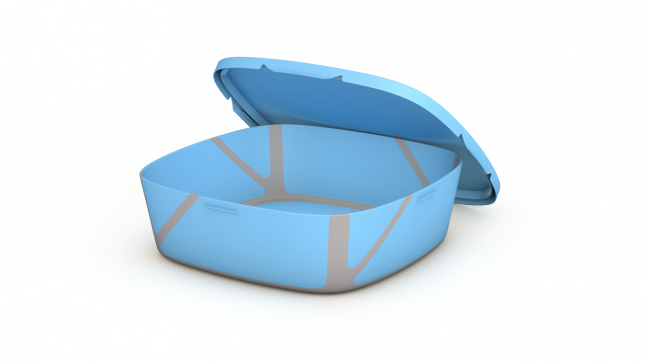 Upfold is a top-notch lunch box that can be easily folded up after you ate your food. Design validation. basically, we are developing the design and measuring market. Millions of people use food containers to take a lunch when they are not at home. Once the lunch is ate - they bring empty containers back day after day. Nowadays this problem can be partially solved with collapsible containers (silicone) but due to their construction and used materials, this solution is fully rejected by consumers. We know this problem and we took care of all aspects of foldable lunch box to bring the perfect solution that matches all requirements. Upfold is a smartly designed lunch box that allows carrying food without any damage due to the unique rigid construction in the opened position and saves over 75% of its space when it’s folded. Upfold designed with two positions opened and folded, and it consists mainly of rigid plastic parts and special silicon implementations which helps to fold the construction. Upfold offers each person a safe carrying of his lunch/food without any damage and providing the same experience as usual containers, such as microwave/freezer friendly, liquid spilling protection, easy to clean. Once lunch is finished Upfold can be easily folded using its unique design. Also, there are already few competitors (e.g. Foldflat) with the similar approach to our but no one haven't released a product. They were unsuccessful due to the organization and design reasons mostly. Also not less important is a unique solution on the market. Initially B2C and B2B once the product is launched.